We take great pride in that we are both farmers and cheese-makers. 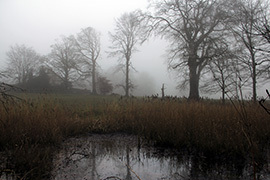 The cheese house nestles in the Osiery paddock and is surrounded by lush grazing pasture. Cashel Blue® is made from grassfed Friesan whole, but un-homogenised milk. Much of it comes from these happy girls – The Pedigree Friesan Cashel Blue herd! Quality of milk and animal welfare is key to good cheesemaking. 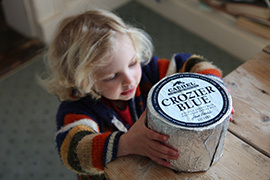 Crozier Blue, our ewes milk blue, is made in the same manner as Cashel Blue® but from Friesland sheep’s milk. Fresh whole milk is precisely pasteurised, taking great care to stabilize but not strip our milk, of the more delicate sweet flavour elements. 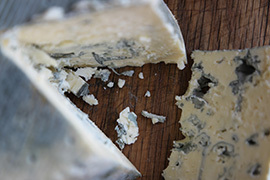 A starter microbial culture is added to start the fermentation process, then Penicillium Roquefortii ,(blue mould), and vegetarian rennet are added at intervals. After about one hour the rennet takes effect – and begins to solidify the milk. Now it’s time to cut the curds – here is our cheesemaker Pawel gently drawing the cheese harp through the curd, to separate out the solid curds from the liquid whey. The curds are turned regularly by hand, we wait, watch and feel, until such time that they are of a sufficiently firm texture to transfer into mould, this is not a precise science and will vary from making to making. During moulding the curds knit together, and the remaining whey will be encouraged to drain out through a process of turning. On day three we remove our cheeses from mould and salt them. Salt is an essential element in our cheeses, in that salt acts as a natural preservative and also plays a flavour element. Cashel Blue® is a blue with a medium level of salt, whereas Crozier blue is a little saltier given that it is matured for longer. On day four each wheel is individually pierced with stainless steel needles, allowing passages of air into the body of the cheese to allow oxygen to penetrate into the centre and provide the conditions for the blue mould spores to develop. Cheeses are transferred for what is commonly referred to as “cave ageing.” Held at around 10 C, the cheeses are left in a natural environment until such time as a slight blue matrix has developed in the interior of the cheese, while the outer rind benefits from a natural exterior mould. Here Sarah is turning the cheeses – which needs to be done every day so that the moisture doesn’t all run to one side. 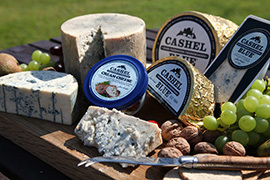 Once blue, all our cheeses are wrapped in foil, Cashel Blue® in gold, Crozier in Silver. The foil will continue to let the blue mould breath, but will stop it becoming too blue! Here is Majella, Sarah and Sergio undergoing the first tasting of a batch of Cashel Blue. Level of blue, texture, acidity are all considered and ultimately determine how long we will age each batch. We then mature the cheese for an additional 2 -3 months. They gradually gain a balance of flavour and creaminess of texture, as the fats and proteins gently break down. They are once again tasted prior to selection for each order received. When our cheeses are finally ready to be sent out for market, we cut the cheeses by hand. We then wrap the cheese, either in special cheese foil, or in prepack cartons destined for supermarket sale. So each and every piece of Cashel and Crozier blue has been cut carefully by hand on our farm! We hope you enjoy it.